Readers captivated by The Revelation Series will be taken to new heights in the sequel to Randi Cooley Wilson’s bestselling addictive pleasure Revelation. In Restraint, a forbidden love will become deeper, a loyalty will be tested, and only darkness will remain. One revelation changed everything, turning Eve Collin’s world upside down, filling it with grief, questions of identity, and allegiance. As she flees enemies who refuse to give up, Eve must also face the mounting attraction between herself and her gargoyle protector, Asher St. Michael. Will she every truly be safe? How much is she willing to sacrifice and what does her future hold? 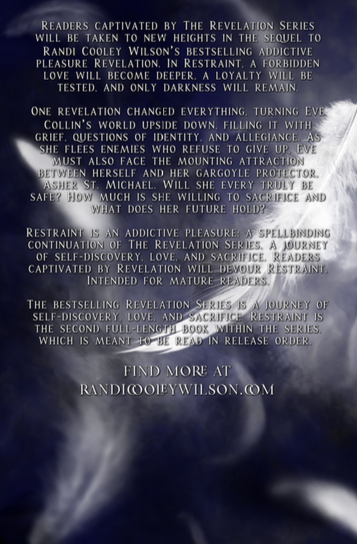 Restraint is an addictive pleasure; a spellbinding continuation of The Revelation Series. A journey of self-discovery, love, and sacrifice. Readers captivated by Revelation will devour Restraint. Intended for mature readers. The bestselling Revelation Series is a journey of self-discovery, love, and sacrifice. 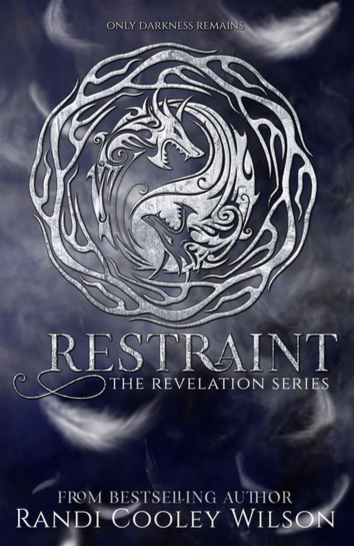 Restraint is the second full-length book within the series, which is meant to be read in release order. Randi Cooley Wilson turns up the dial on everything in Restraint, the sexual chemistry, the danger, the connection between Eve and Asher, the romance, the risk they take if they pursue their attraction. And the end? Another gasp! What?! Where is book three? Must read now! Restraint will hold you hostage through all of the twists and turns until the very last page. It’s captivating and the characters bring the story alive with their sweetness, love, and fierce protectiveness. Loved it! I was blown away by Revelation, the first book in this trilogy. Restraint is just as good, if not better, than Revelation. The characters in this book are all fantastically well written and we get even more depth and knowledge about them. Absolutely fantastic second book in the series. HIGHLY RECOMMENDED to all! There's passion, anguish, jaw dropping heart-stopping moments, and heart-breaking scenes too...it was one of those books where 'just one more chapter' leads to another 3. I was engrossed from page one. Literally could not put the book down. Restraint was an awesome follow up to Revelation and I can't wait to read book 3!